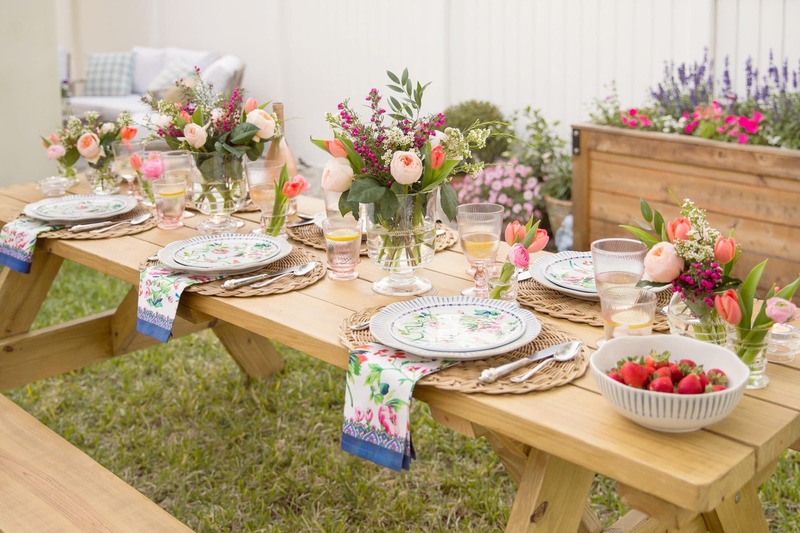 Entertaining is one of my very favorite things. Growing up, my parents entertained often and well so for me, entertaining feels like a warm hug. I love having friends and family over and hearing their laughter, clinking of glasses, and the opening of just one more bottle of wine well into the night. 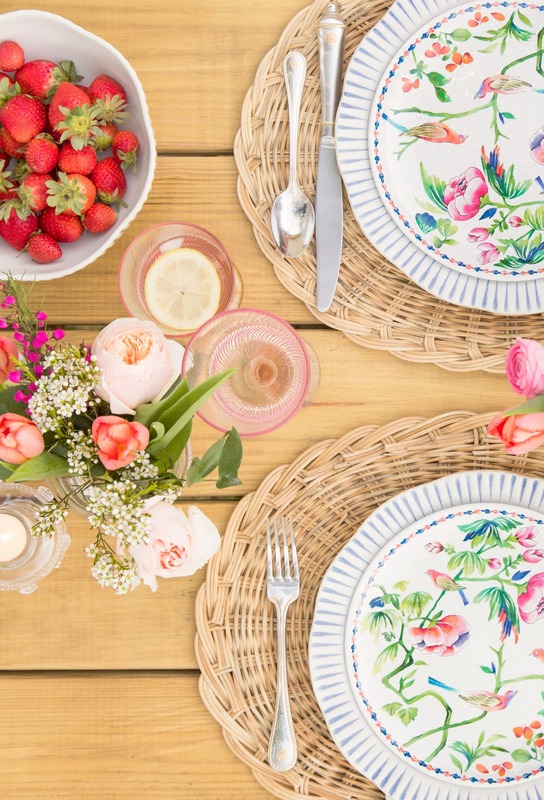 There is nothing better than a dinner party that lasts past everyone’s bedtime in my book. My goal when planning a dinner party is always to make our guests feel so comfortable that they forget their phones and start relaxing like it’s their own home. Over the past few years I’ve found a few tricks that cultivate this type of atmosphere. 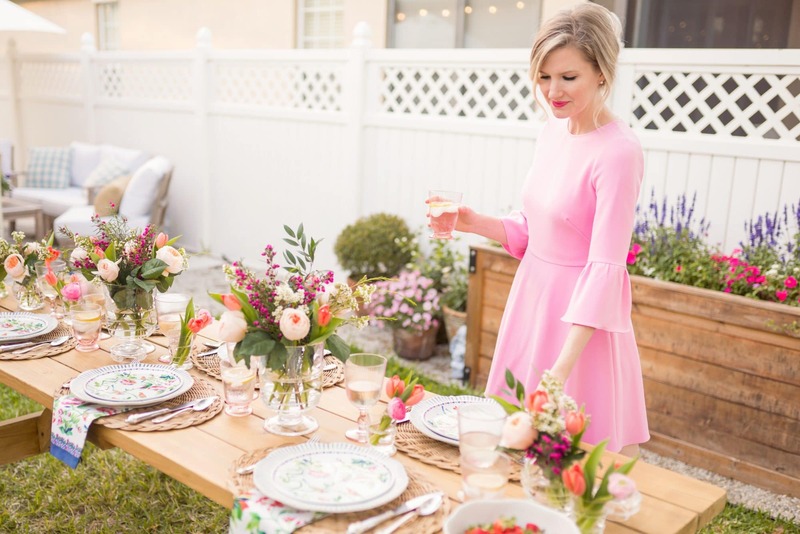 So, I thought it would be fun to share them with you as Easter weekend kicks off and you start gathering with your loved ones for brunch, dinner, and everything in between! Just because you are having friends over doesn’t mean you have to sit at the dining room table. Get creative and think outside the box. 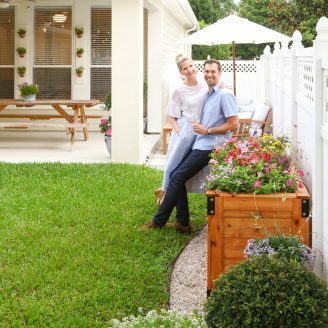 Right now in Florida, the weather is nearly perfect, so when we were deciding where we wanted to set up our table our first thought was outside! 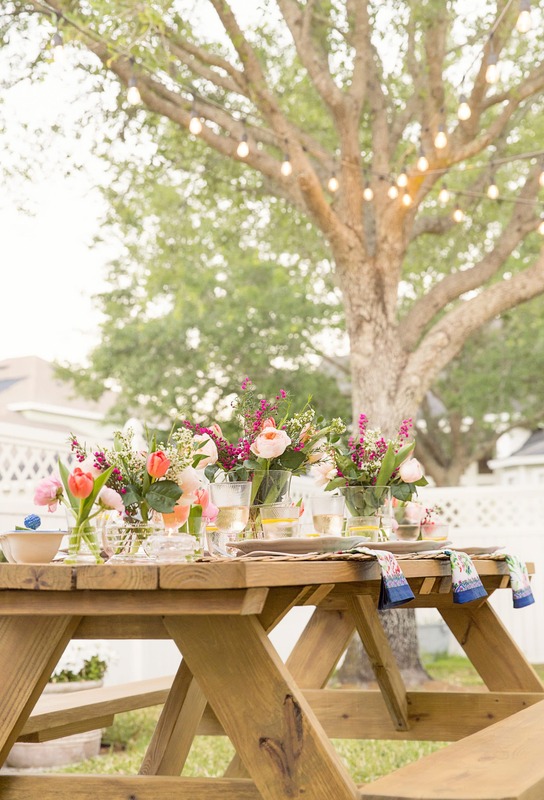 But instead of keeping our picnic table under the patio where it normally lives, we brought it out to the center of the yard under the twinkle lights, which gave the setting a special feel. Put another way, all we did a was move a 6-year-old, $200 craigslist table to a new location, and boom. All the sudden we had the perfect setting! It’s funny we had never thought to do this before. Instant cozy. 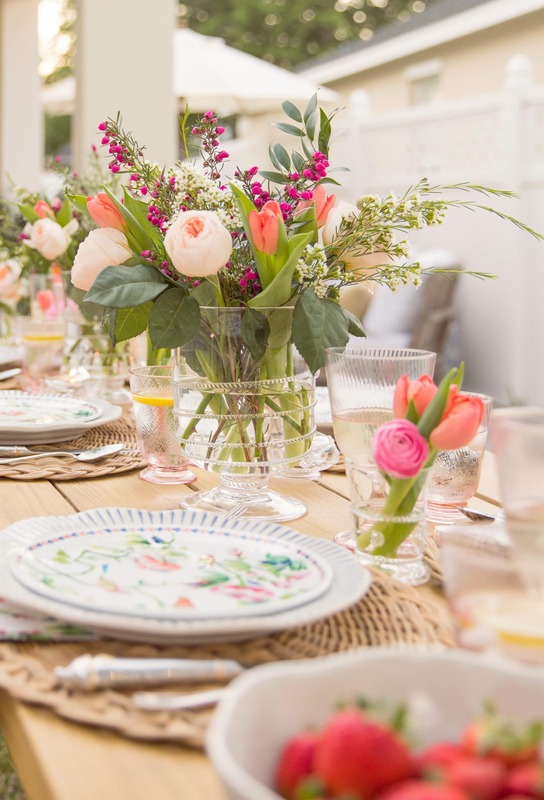 I love a fussy, over the top table setting more than anyone, trust me, but in my experience, less is more when it comes to home entertaining. Now clearly I don’t mean for you to not put the effort in. 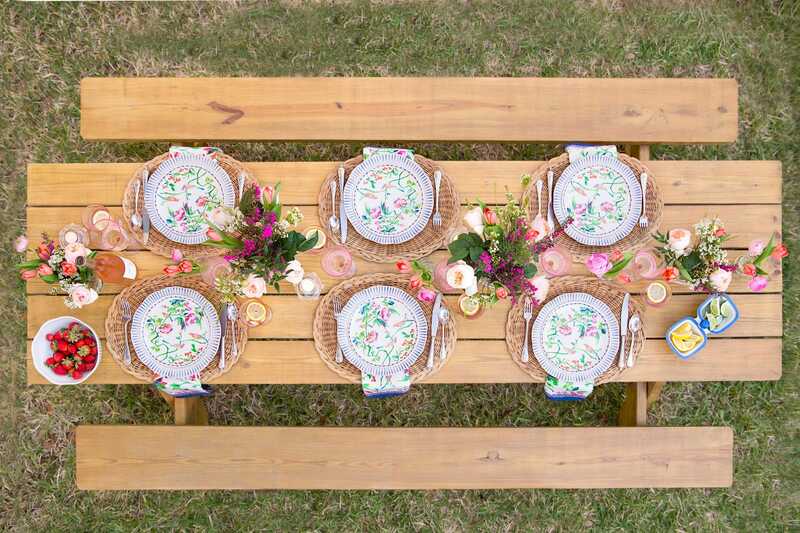 Do that, but just keep comfort in mind by making sure your guests have room to use their utensils and pick up their wine glass without knocking something over or feeling like “it’s too pretty to touch”. 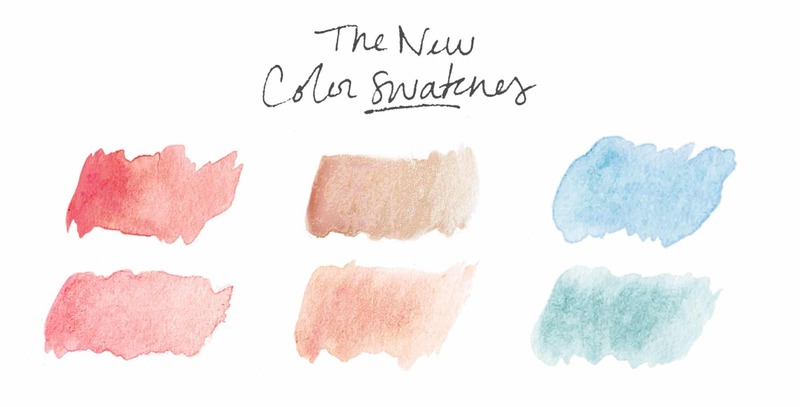 Pretty is good, we want pretty, but we also want comfort! 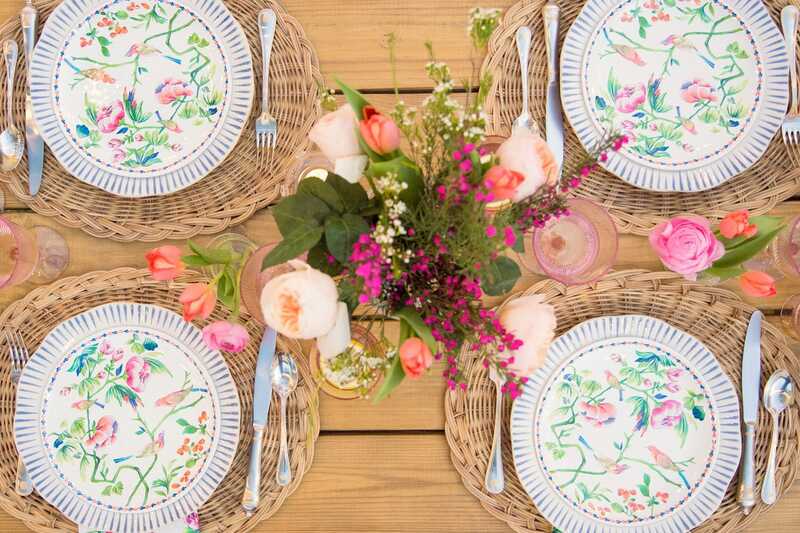 My motto when setting the table is “thoughtful and elevated”. For this particular table scape I used my favorites from Juliska to make a casual yet elevated feel. 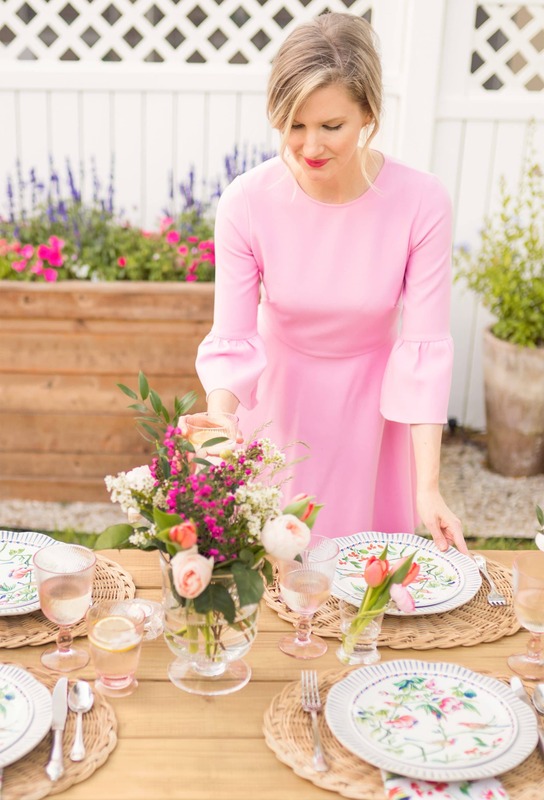 I fell in love with Juliska a couple year ago when I picked up their drinking glasses at Bloomingdales (on the table in pink) and have loved the casual elegance of their brand ever since. 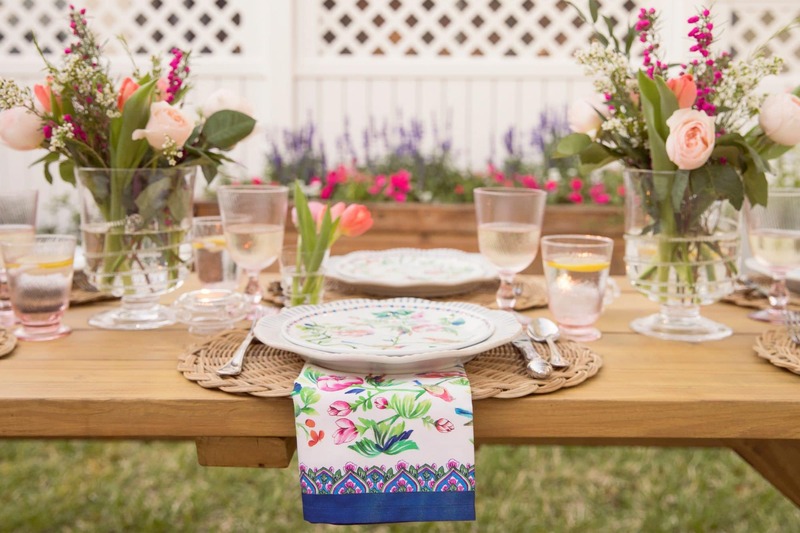 The floral plates mixed with the colorful glasses really pull the outdoor setting together. To me, it’s always worth investing in table ware that’s beautiful and well made. They can last a lifetime and create unforgettable moments over and over. 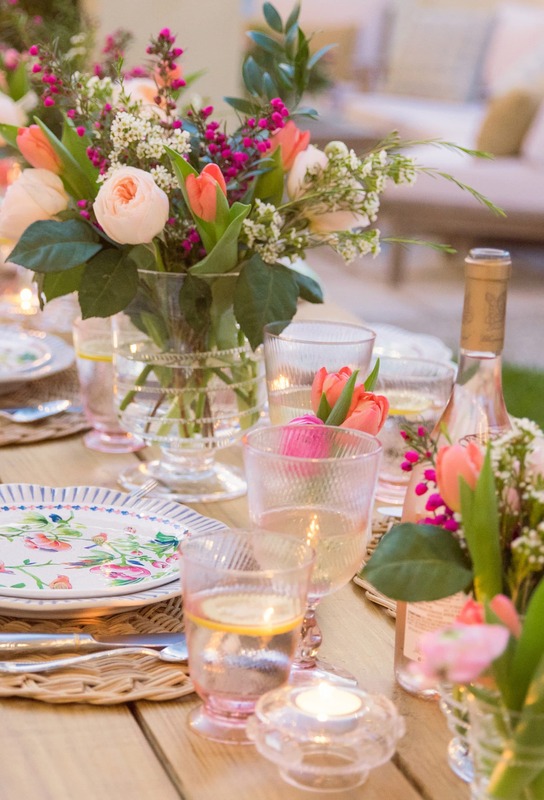 You can absolutely never go wrong with candles and sparkle when it comes to your table settings. Ihe more candles and pretty clear glass you can have light bouncing off the better. I love layering in tea lights and votive candles throughout the table to really give it that glow. I have a big box of small candles in our linen closet that I always keep on hand because you can really transform any space with a few candles. 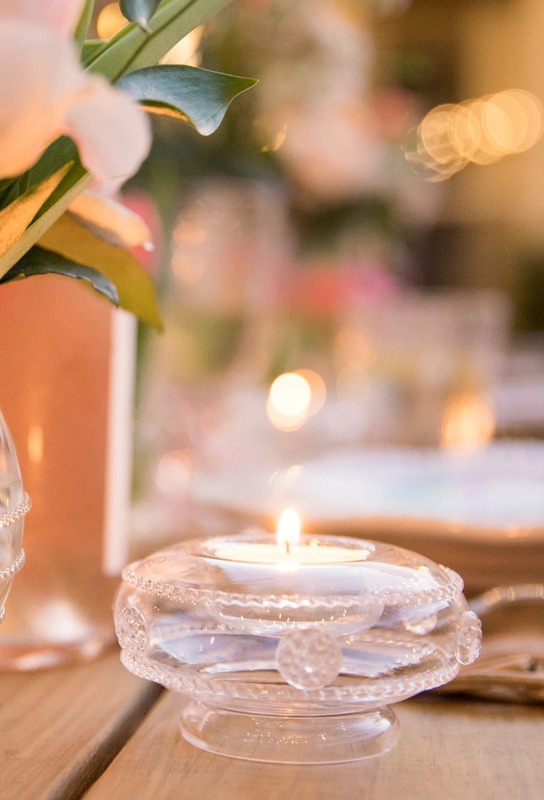 These pretty glass tea lights are my go-to… I feel like they have built-in sparkle! 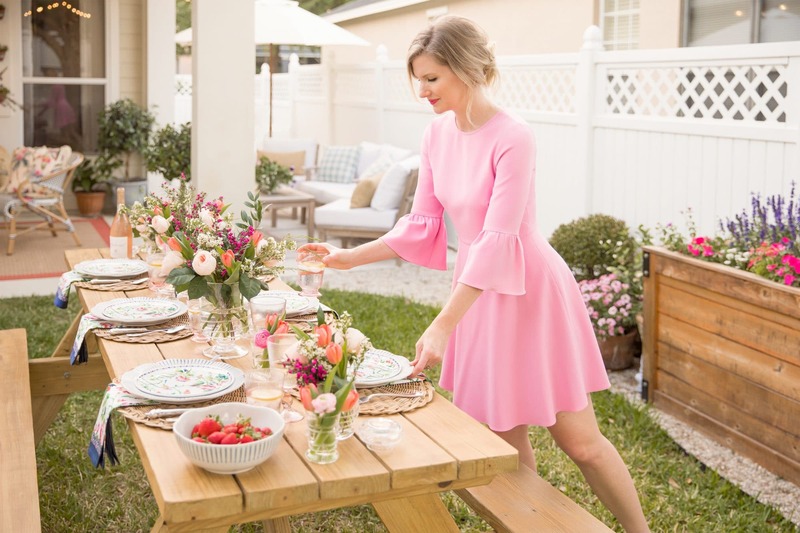 So there you have it, whether it’s girl’s, date, family, or friend night these three easy tips will help you turn your next get together into a soirée! I hope they help inspire you this weekend as you celebrate Easter with your loved ones! Happy Good Friday, friends. 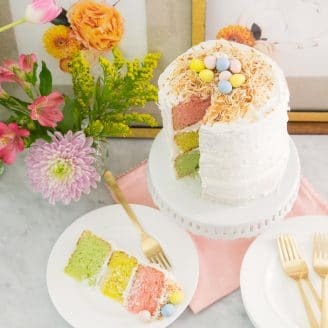 Impress Your Guests With a Pastel Ombre Cake! 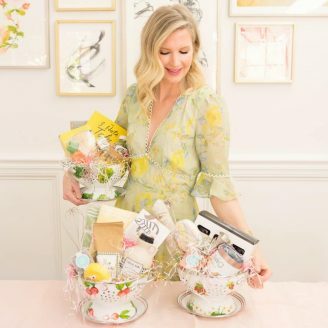 Grown Up Easter Basket Giveaway! Previous Post Impress Your Guests With a Pastel Ombre Cake!